Teen-Middle grade school novel by Linda Maddox. 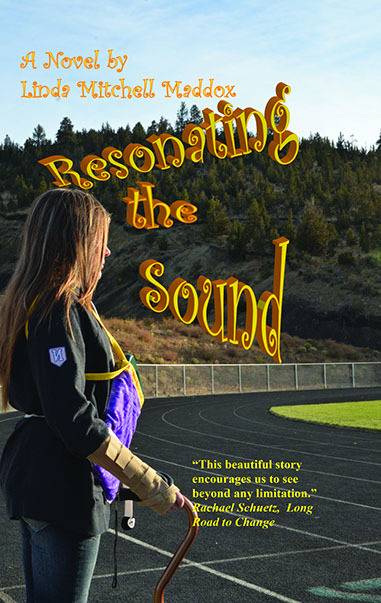 Resonating the Sound is a teen-middle grade novel that takes place during the eighth grade year of a girl who has suffered a Traumatic Brain Injury during sixth grade and finally agrees to use an augmentative communication device after not regaining any of her vocal abilities. A special relationship develops between her and a boy in her class who has gifted Aspergers. He plays a major role in altering the device, which gives the main character access to pieces of a cream she thinks are lost forever. This novel takes place at fictitious Mountain Ash Middle School and exemplifies a variety of disabilities that challenge our whole population. Resonating the Sound examines some aspects of Traumatic Brain Injury in one character and portrays some character traits of Gifted Aspergers in another. The traits portrayed are unique to the individual fictional characters in this story. This is a story about obstacles and ways the middle school age characters in the book choose to deal with them in their lives. It is written with students at multiple reading levels in mind, created specifically to target those who have recently mastered the skills for decoding. Still, it offers challenge and a wealth of vocabulary and abstract concepts to the reader at higher levels in their reading mastery. For older students and adults, it is a story to enjoy, with characters from whom to learn.